The first time I met Kaci, I was handing my little one over to her care at our church's nursery. I noticed what appeared to be a baby bump and against all of my better instincts, I asked "Are you expecting?" Thankfully, she said yes and that she would be finding out the baby's gender later that week. She already had twin boys at home. Well, a year and one more boy later, our bible study play dates were heavily male, with five energetic boys between us. We have both bonded over our not so secret desires to dress a little girl and simultaneously breathed a sigh of relief that God gave us boys. In the three or so years that I have known Kaci, we have fellowshipped together in four bible studies, transitioned from our cozy, one hundred person church to a much larger congregation and began serving together in our church's children's ministry. Over time, we have created one of those wonderfully rare friendships that takes place largely outside of our children. This means we are actually able to have real and complete conversations, without interruptions for more Cheerios, a nose wipe, a kissed boo-boo or a potty-training trip to the bathroom. I am acutely aware that when any of my friends' parents experience an illness, I am probably the last person they want to talk to. My story does not end well - my dad lost his battle with cancer nearly four years ago. Yet, Kaci and I have bonded over cancer. She is the rare friend who doesn't avoid talk of chemo treatments, hospice and how her boys will remember their grandfather when he is gone. I know this cannot be easy for her and I am grateful for her vulnerability and trust in me. But, sharing with Kaci has been healing for me, too. I have been able to confide in her about so many things in my life: my anger, sadness and eventual acceptance at losing my father, complex and changing family relationships in the aftermath of his passing and even my "Mommy guilt" when Wilson knocked out his front tooth. She has always been a calming force in my life, speaking truth in love. One of my favorite parts of Bake Somebody Happy is pairing people with their pie. When I was pondering what to make for Kaci, one word kept resounding in my head - "sweet." Then, it hit me - it was like a sign. Ok, it actually was a sign. 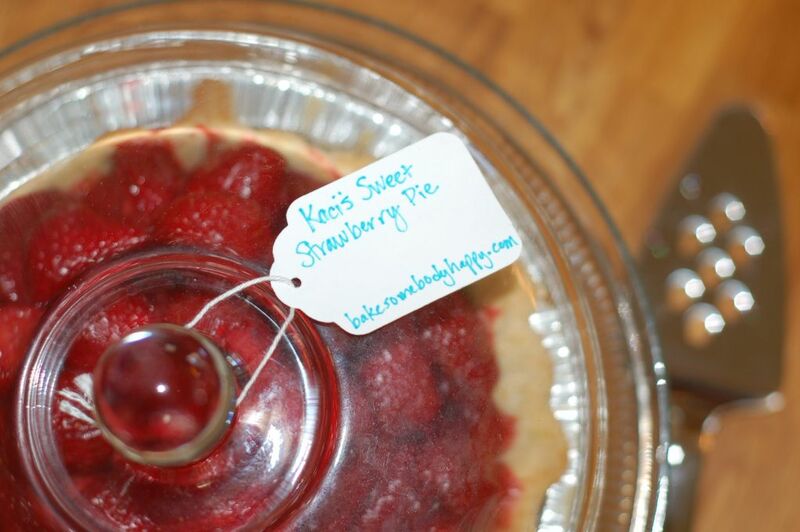 Kaci's "Sweet Strawberry" pie. 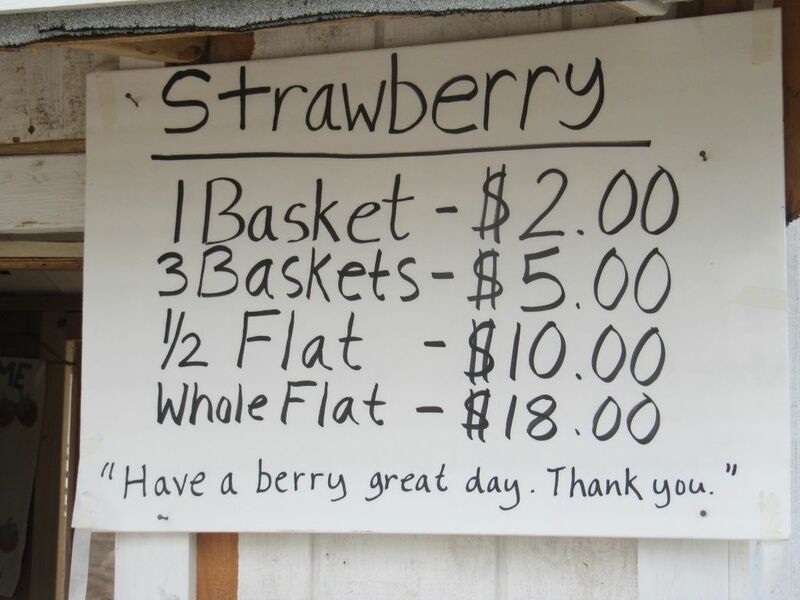 I splurged a whopping $10 and purchased a half pallet of beautifully ripe strawberries from a local roadside stand. 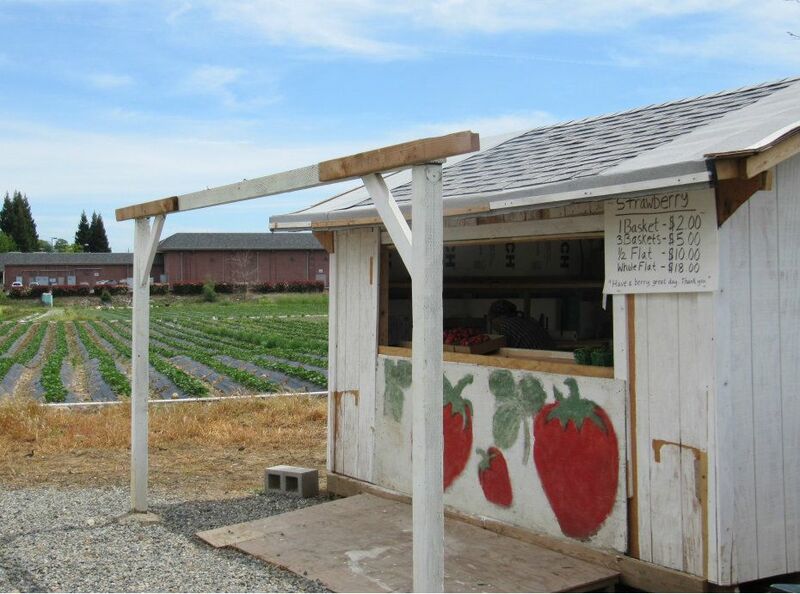 I am so spoiled that I can walk just a few blocks from home to buy berries from the very person who grew and picked them fresh from their field earlier that day. And as an added bonus, the recipe only called for four pints of berries, so I was looking forward to a little mid-day snacking. 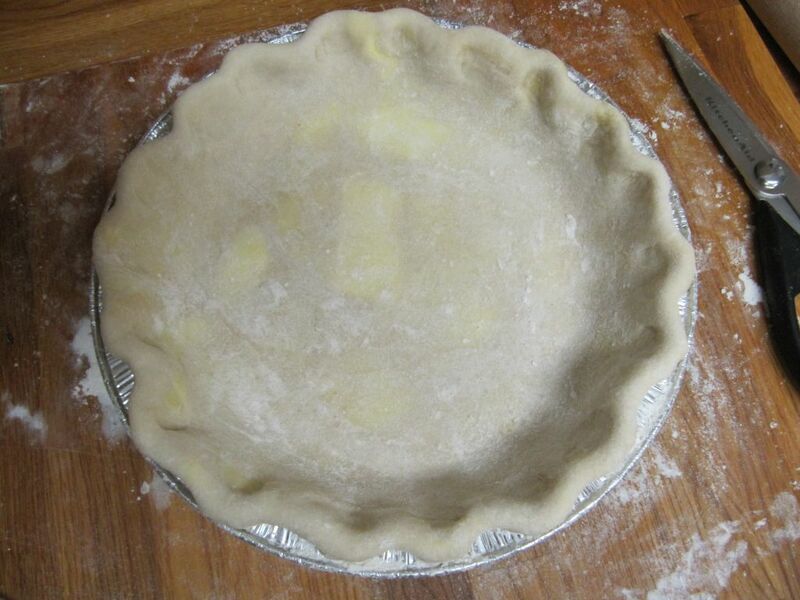 I prepared my usual pie crust with a combination of butter and vegetable shortening. After several hours resting in the fridge, I plopped the chilled ball of dough out onto my heavily floured cutting board and began to roll it out. This seems like as good a time as any to mention that I absolutely love my cutting board. Will made it from a slab of butcher block leftover from our kitchen remodel several years ago. It is large, hefty and solid and looks just like the fancier and much more expensive versions you find at any housewares store. I have such a resourceful husband! 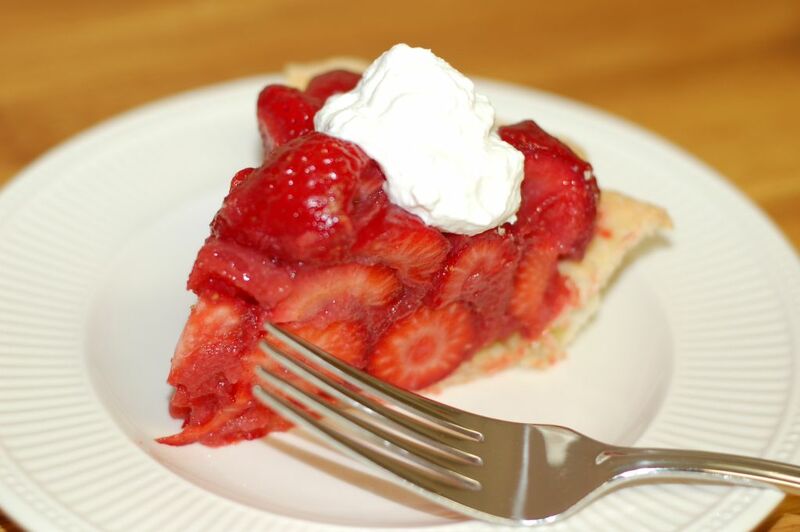 When I began researching strawberry pie several weeks ago, I was both surprised and bothered to find that most recipes called for strawberry "goo" from the produce section. Well, no shortcuts allowed here. 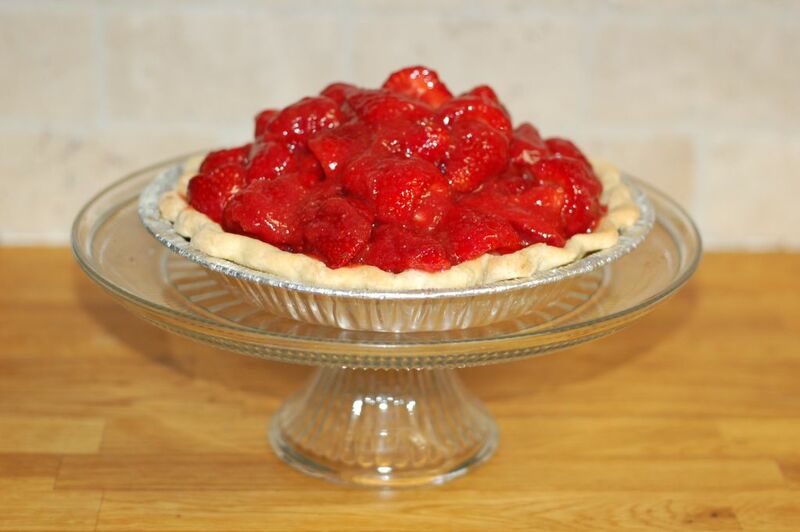 I mean, by the time you fill a prepared pie crust and pour prepackaged glaze all over the top of a pint of strawberries, have you really made your own pie at all? So, I attempted to perfect my own glaze. 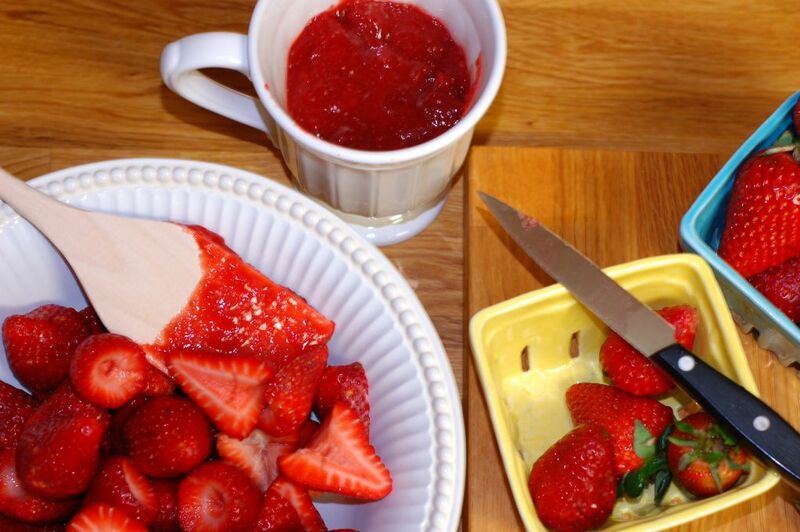 Puréed strawberries seemed like a natural base, so I whipped up a few less than attractive berries in the blender and added the purée to a saucepan of sugar, cornstarch, salt and gelatin. 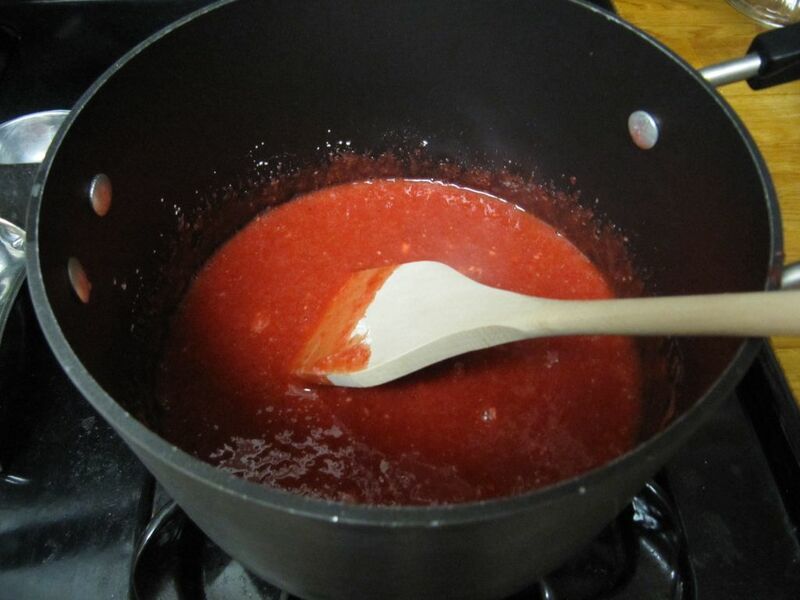 I boiled the entire mixture until it began to froth, then calmed into a dark, thick gel. 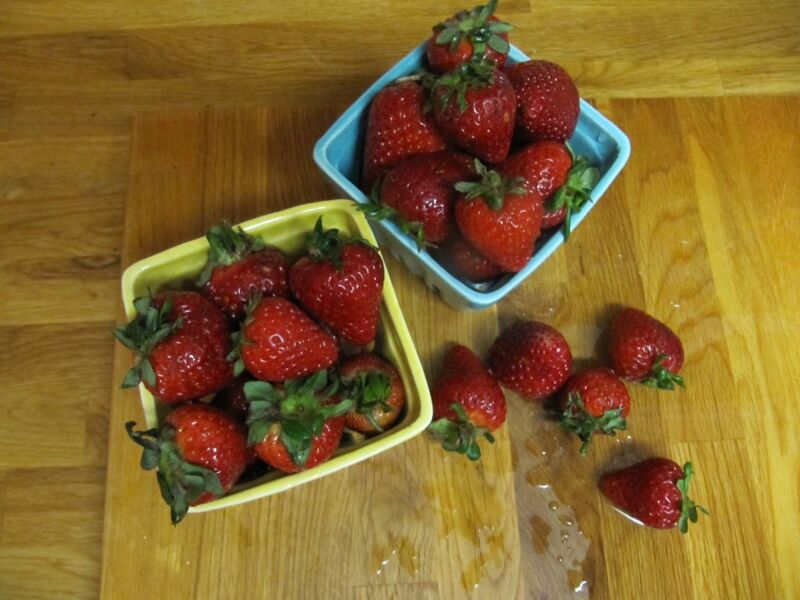 While the glaze cooled, I rinsed and stemmed the remaining berries, cutting the larger strawberries in half and leaving the smaller ones intact. 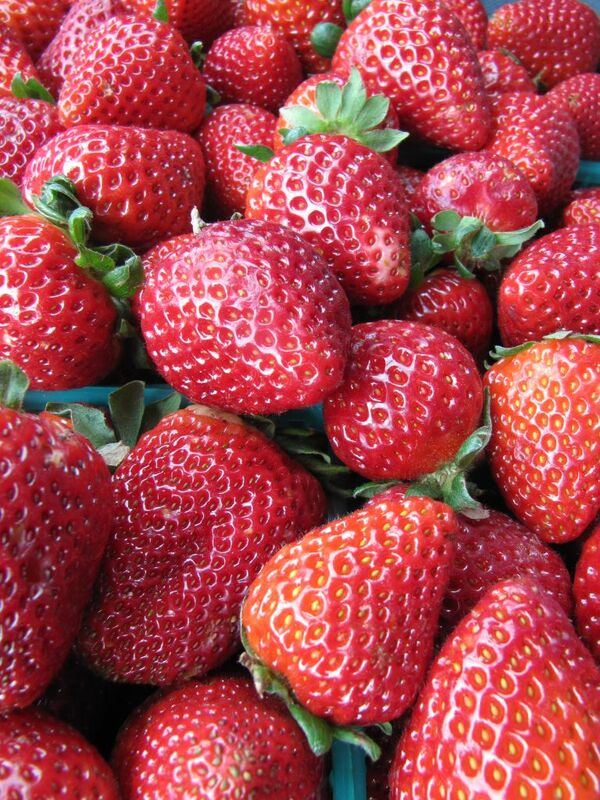 Then, I folded the berries into the glaze until they were all sticky and glistening. I scraped the entire bowl of strawberry goodness into the pie crust, taking extra consideration to carefully arrange the berries face up. Then, I placed the pie into the refrigerator to chill. And while I was at it, why not tick another box off my checklist of baking firsts - homemade whipped cream. To my surprise, I had all of the ingredients on hand. So, I whisked the heavy whipping cream into soft peaks before adding a sprinkling of powdered sugar and a splash of vanilla extract. Now, I am not typically a fan of whipped cream. In fact, I always order my Grande soy iced mochas sans whip. 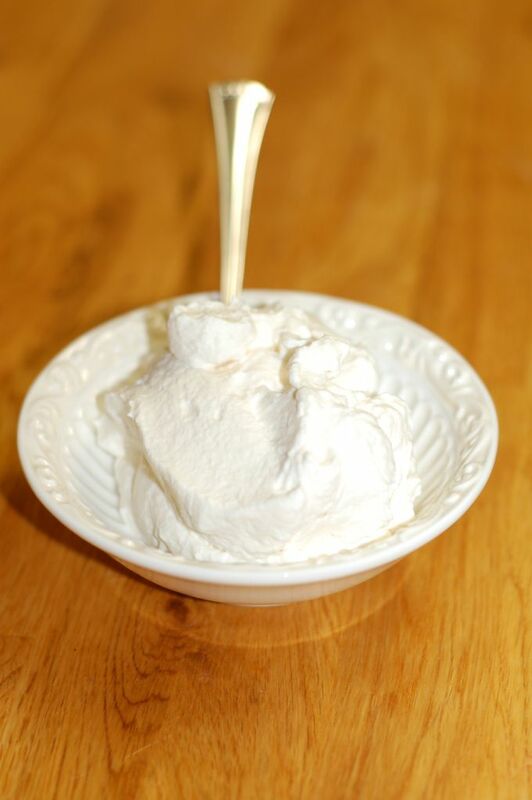 But, I have to agree with my boys on this one - whipped cream from scratch is pretty "yummy." 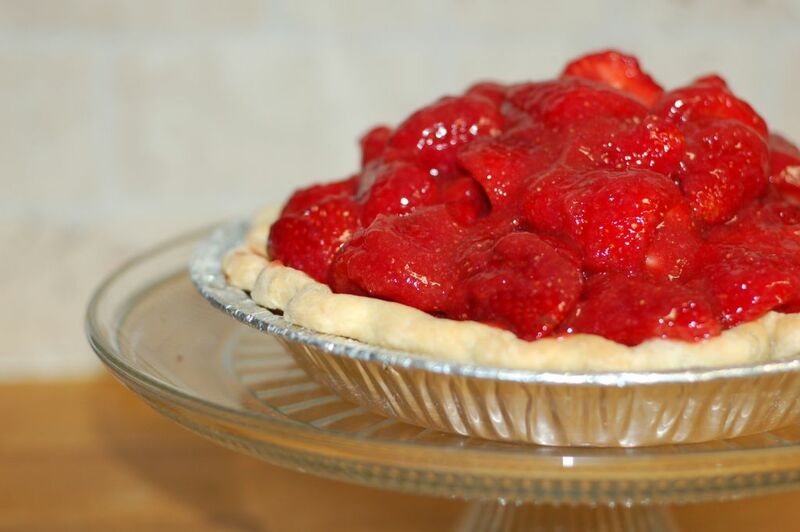 Strawberry pie has always been my personal favorite. 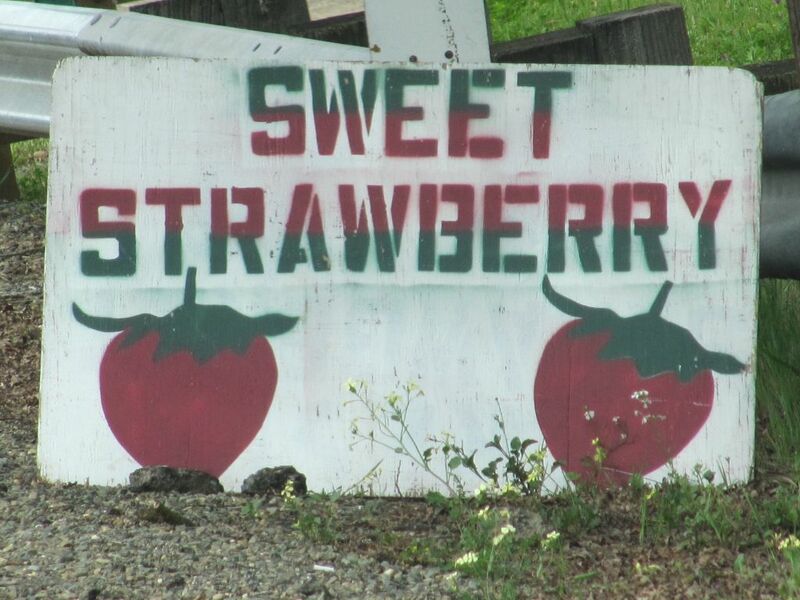 I have looked forward to the arrival of strawberry season since childhood dinners with my parents at Marie Callenders. 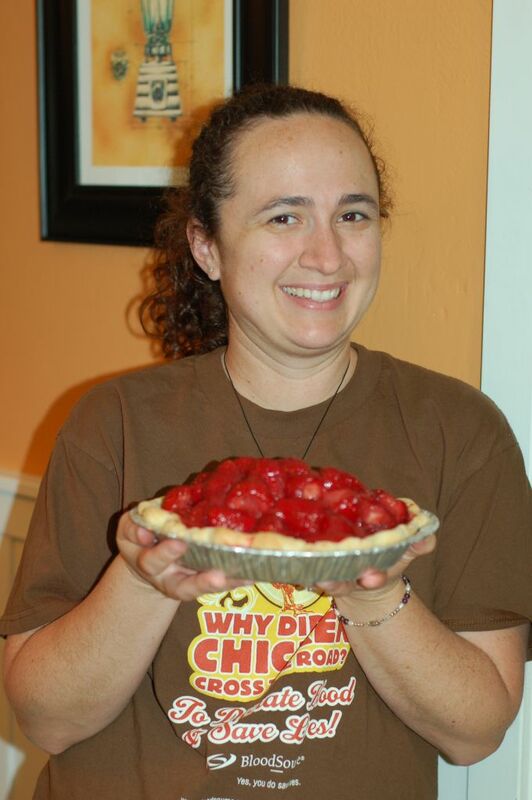 Just seeing those beautiful pies piled high with red berries in the pie case made me want to skip straight to dessert. But, as this pie journey is teaching me, homemade is nearly always better, especially when shared with a good friend whose natural sweetness gives me a reason to bake.